International Paper Red River Mill in Campti has provided livelihood for more 400 employees and numerous sub-contractor employees. Some families have had three generations rely on the mill to provide for their families since in was built in 1974 as Western Kraft. Some generations have since retired, while others are just beginning their careers there. Since 1974, the mill has been owned by Willamette, then Weyerhaeuser. International Paper purchased it Aug. 4, 2008. International Paper is a leading global producer of renewable fiber-based packaging, pulp and paper products. “We produce corrugated packaging products that protect and promote goods and enable worldwide commerce; pulp for diapers, tissue and other personal hygiene products that promote health and wellness; and papers that facilitate education and communications,” said Mike Carroll, Mill Manager. The Red River Containerboard Mill is located on approximately 850 acres just north of Campti on Hwy 480 near the Red River. While production of product is their purpose, safety is their focus. “Safety is our most important responsibility at our Red River Containerboard Mill. Our entire team is dedicated to a culture of safety first. No job at the mill is more essential than getting all of our team members, visitors and contractors home to their families safe at the end of the day,” Carroll said. The majority of the 400 plus team members live in or around Natchitoches Parish. The mill, which is a union facility, United Steel Workers (USW), has two paper machines that produce high-quality containerboard. The paper goes to various box plants to become the products people depend on every day. End uses of the paper include corrugated boxes, shipping containers and paper grocery bags. Sweeping changes are imminent with the new tax bill. From International Paper’s perspective, the tax bill will boost the U.S. economy and benefit mill customers, employees and the company. The tax bill will provide greater certainty and confidence for International Paper around how capital is invested in the US. In 2018, International Paper will invest $1.2 billion to maintain, upgrade and expand US facilities. As with most industry, the need for responsible and qualified employees is ongoing. “Our Red River Containerboard Mill partners with Northwestern State University and the Northwest Louisiana Technical College to ensure a sustainable workforce for our operations and the area,” Carroll said. 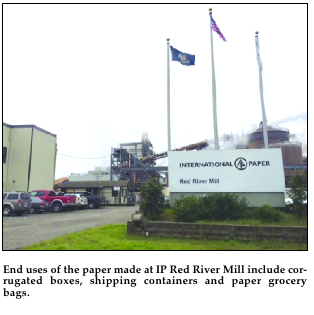 Red River Mill accepts applications for posted positions online at internationalpaper.com/careers.